“Everything is a remix.” It’s hard and useless to distinguish what is “the original” and what is “the plagiarized,” especially in such a resource sharing society. People/Artists are all influenced by everything around them, or things that have existed for centuries. We learn from the existing, the old, and build our new thought and understanding upon them. That is how creativity appears. According to Kirby Ferguson, the main idea of remix is to “copy, transform, and combine.” Remix is a unique form of art, whose process includes copying. 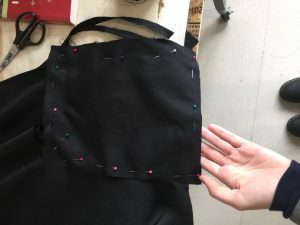 Therefore, it is even harder to judge who should be the official “owner” of the final product, and whether the work counts as plagiarism or not. So I think it depends on how one does the remix. If he/she just simply takes multiple works from others, re-edits them and then combine them into one piece, I consider his/her work as plagiarism. However, if he/she picks little elements (eg. different sounds from documentary videos) of multiple works and use them to make a completely different work (eg. creating a piece of music), then the work is of creativity. I can’t agree more with Ferguson that “creativity comes from without, not from within.” We might try really hard to avoid copying someone or something, but it doesn’t mean that we are conscious of all of the influences brought by our surroundings (much like the Bob Dylan song in the video). Originality doesn’t really exist —we simply rework what already exists in our own way. Project Name: Don’t Scare Mama Ruth! 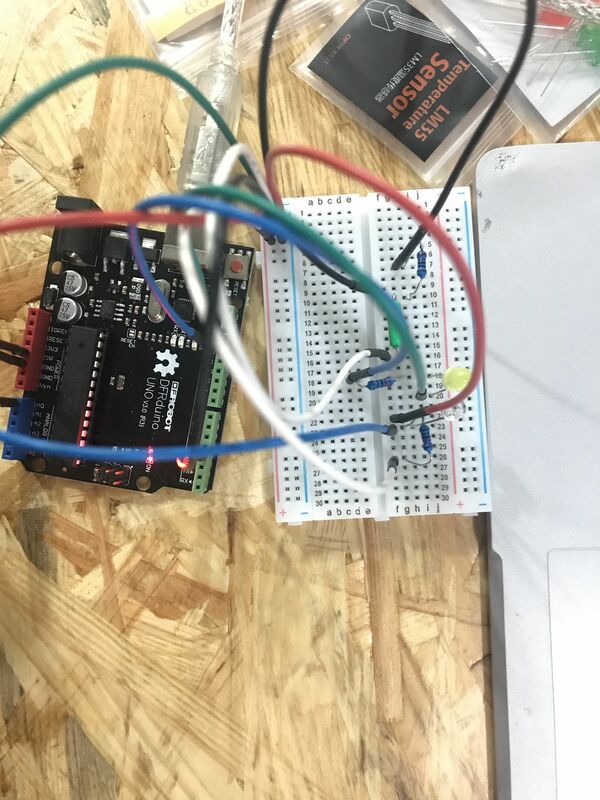 2) From there I knew that I could take it a step further by letting the led light up a light sensor, triggering something else, preferably a buzzer. 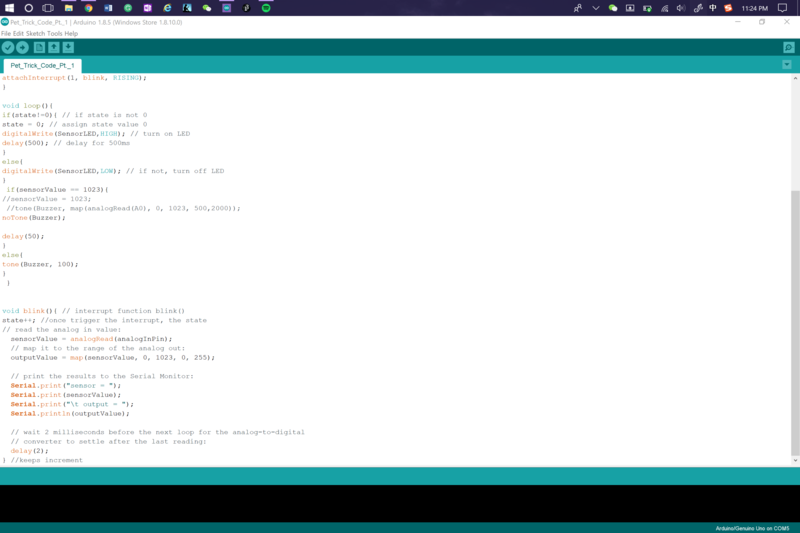 So I added the necessary components and started messing around with the code. 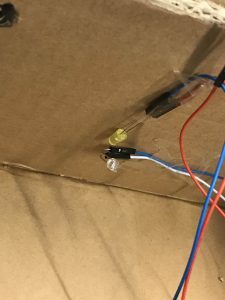 However I hit a snag, I couldn’t find out how to connect the light sensor to the buzzer and make it sound when the sensor received light. After some help from Marcela though I learned the terms of tone(); and how to monitor what the light sensor was receiving. 3) From here it was just a matter of organizing the artistic side of the project, not my strong suit. I found a box in the equipment room and paper in the lab and started putting my little house together. 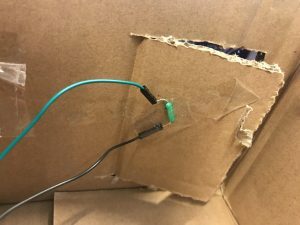 The first step was cutting out a door to create interaction and attaching the tilt sensor via extension wires. 4) The next step was finding the best place to put the led and light sensor, after trying multiple places I found that the best and most reliable place to get the change in value I needed to trigger the buzzer was behind the door. 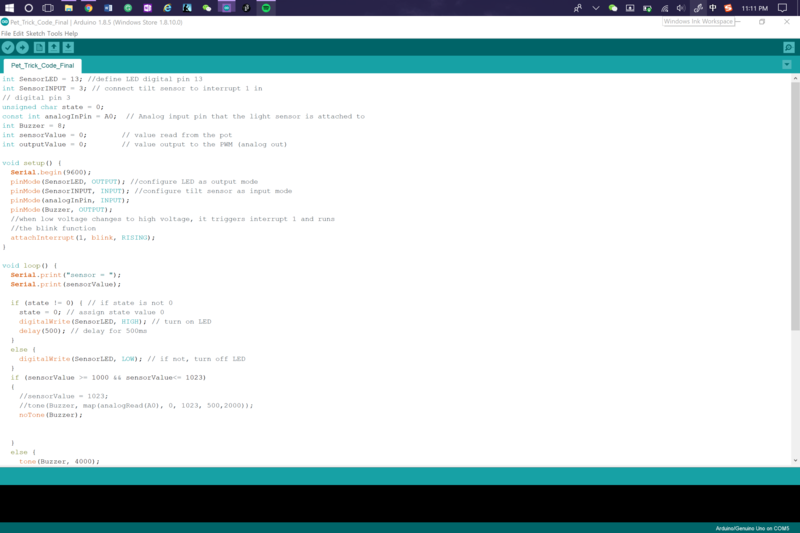 Because the light sensor was unreliable at times I had to edit the code to use a range of values that wouldn’t trigger the light sensor since it would settle on random numbers when it went into a state of rest. 5) Another recommendation of Marcela was cutting a hole in the box and putting the buzzer facing outward so that it would be louder to those interacting with the project. This ended up working very well on Friday where I received compliments on it from the professors and fellows and everyone who interacted with the project was much more surprised by the volume. 6) Finally, I was able to seal the box and cover it in paper in a last ditch effort of looking somewhat artsy. I brought it to the demonstration where overall the professors and fellows thought it was a really intriguing pet trick with the only suggestion of adding a little bit more, like a picture of a grandma in the house to solidify the story. Other than that they thought it was really good. I feel that I achieved my goal as I created a complex project that showed my skills and worked the majority of the time despite inferior sensors. Yes, it was interactive because unless you opened the door to the house then you wouldn’t trigger any reactions inside. This is Mama Ruth’s house, she’s a sweet old lady but if there’s one thing she doesn’t like it’s surprises. So if you want to go inside you have to be fast, if you take too long the light comes on and then Mama Ruth might scream! The user can be anyone regardless of name or gender, as the interaction is between them and an imaginary third party. During the show, the majority of the time the project worked as expected, however, as the light sensor was low quality there were a couple times when it paused for a second longer than expected. However, they weren’t problems of the code, just the sensor. I’d love to make something similar to the theremin style instrument just because I grew up learning and being surrounded by music so it interests me to mix music and sound with technology. I think that fun things could be done with something like a theremin. Our main intention, in the beginning, was to understand the sensors that we were given and not necessarily to create complex circuits so we chose a vibration sensor and made a simple circuit that would react to a tap by turning on an led light. We chose the specific sensor because it didn’t seem as complex as some of the others but not the simplest one to work with. The output was chosen to simplify the experiment and maintain the central focus on the sensor, not on the output. 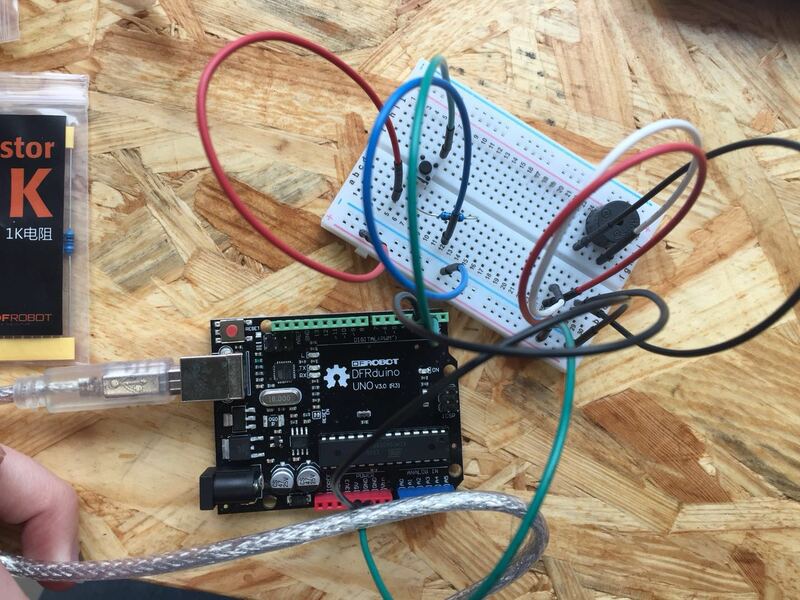 To program, we based the whole circuit off of the example in Arduino titled “knock” so we didn’t need to modify anything as it was all designed to work pretty effortlessly. The first time we couldn’t get it to work, but when we switched out the faulty vibration sensor, it worked much better. The work we did was simple but served the purpose of showcasing the sensor in a way that was simple, and interactive. The vibration sensor probably has some distant cousin that is used as a touchscreen, that allows us to interact with our personal devices. In fact, when you think about it, most things require some physical touch interaction that would use something like a vibration sensor including the laptop I’m using right now. If I were to continue experimenting with the circuit I’d start to add things, and try to differentiate different strengths of taps, to different reactions from the circuit, ie. a light tap turns on the light, while a hard tap turns on the buzzer. Writing code is similar to dumplings in that when placing an order, and when writing code, there is an order that must be followed otherwise the result won’t be what you expect. If one thing is slightly off then the result can be completely different from what you expected it to be. It’s also similar in that it’s very rewarding when done correctly, and the result is sitting there before you. There are obvious ways that computers influence human behavior, the extreme increase in productivity and constant availability has multiplied the stress that we feel every day, while it also allows us to stay connected with loved ones across the world. Without computers, we wouldn’t have been able to go to the moon or travel in the air. Computers are a critical part of our daily lives and without them, the world would be a very different place. To be honest, I know a lot about her already from living with her and talking to her so it wasn’t too difficult to think of what she would possibly like. In the past, she mentioned how she’s been wanting a stress ball of some sort for her to squeeze and to work out her wrists. Also, she absolutely adores cats and stuffed animals, so I decided to combine the two. Below is my drawings for my idea. 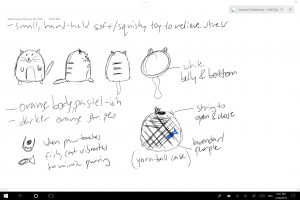 Basically what I want to create is a small, hand-held stuffed cat that fits inside a pouch that looks like a yarn ball, since cats like to play with yarn. When it’s in the yarn ball, it looks like a plain ball for her to squeeze, throw, or do whatever she wants with. When she takes it out, she can just look at it and squeeze it, since that’s what she likes to do with her stuffed animals. 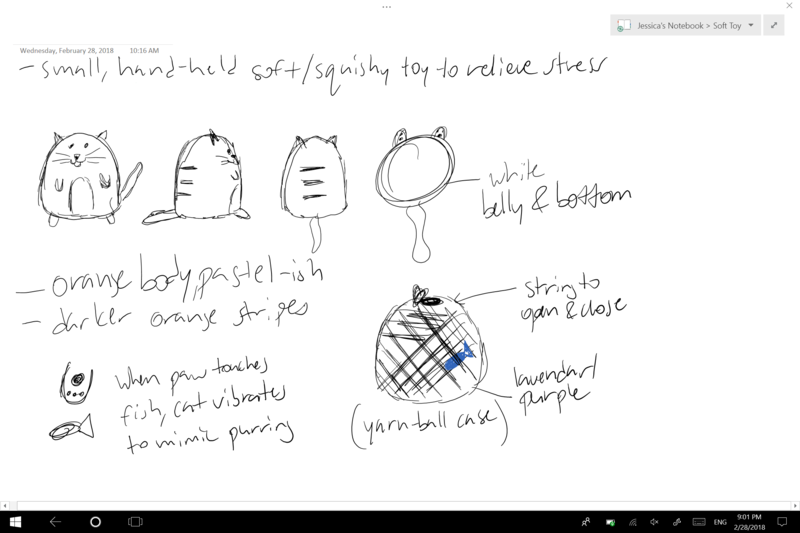 But I also know that she really appreciates small electronic effects so I thought if I have time, I could make the cat vibrate to mimic purring when it touches a fish that’s on the outside of the ball, or something along those lines. What’s your favorite kind of cat? What kind of toys do you like? What is it about tactile, soft toys that you like? These questions helped me with the more details aspects of the project. In the future, I plan on getting more information on how she holds things, her hand size, and more hand related stuff so that I can see what would make the toy most comfortable for the user. 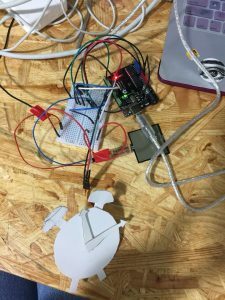 I first came up with the idea because I knew I wanted to use some kind of sensor that could lead to a funny or unexpected reaction, and during a brainstorming session I came up with the idea of using a sensor to trigger an alarm clock. 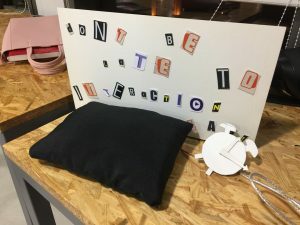 I wanted to create a cute set-up where the participant lays their head on the pillow to trigger a little alarm clock. 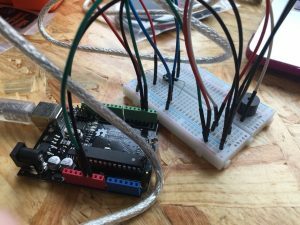 I started with research as I wasn’t familiar with the force sensing resistor and knew I wanted to use it in order to create the project. After reading online about various projects that were created with the force sensing resistor, I started playing with the arduino and breadboard to replicate some of them so I would understand it and be able to branch off to create my own project. First I copied an online schematic to create a system that triggered a piezo speaker when enough force was applied to the force sensing resistor. While this took a while and was a little complicated, I eventually completed it according to the online guide and was able to connect the resistor with the buzzer. Next I tweaked the code so that the buzzer beeped like an alarm. 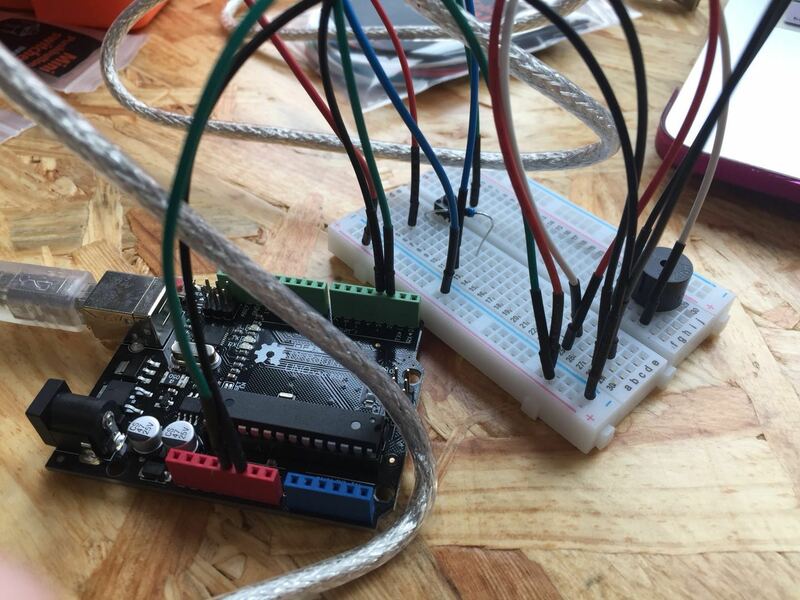 Next, I scrapped the arduino and breadboard (after documenting how I created the first buzzer) and tried with a separate schematic to make the servo connected to the force sensing resistor. This was a bit more challenging as I couldn’t find any direct schematics or code online, but by patching together separate code for servos and the code I used previously I was able to make the servo move when enough pressure was applied. Then I tried to put them together. 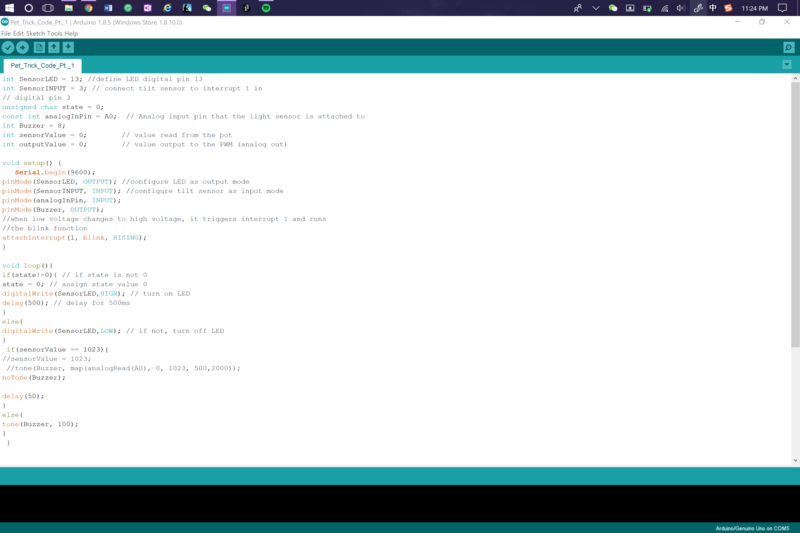 This was also a challenge as I had to make the force sensing resistor signal both the buzzer and the servo to go off at the same time for the same amount of pressure, but after getting help from a few fellows I was finally able to get the code working. Afterwards I simplified the code (again with the help of fellows) and continued testing it to make sure everything worked. Next, I got to the crafty part. I used cardboard to cut out and glue together a little alarm clock, and then taped the arms of the little fan on the servo to the back of the alarm clock so that it jumped around when the pressure triggered the servo. 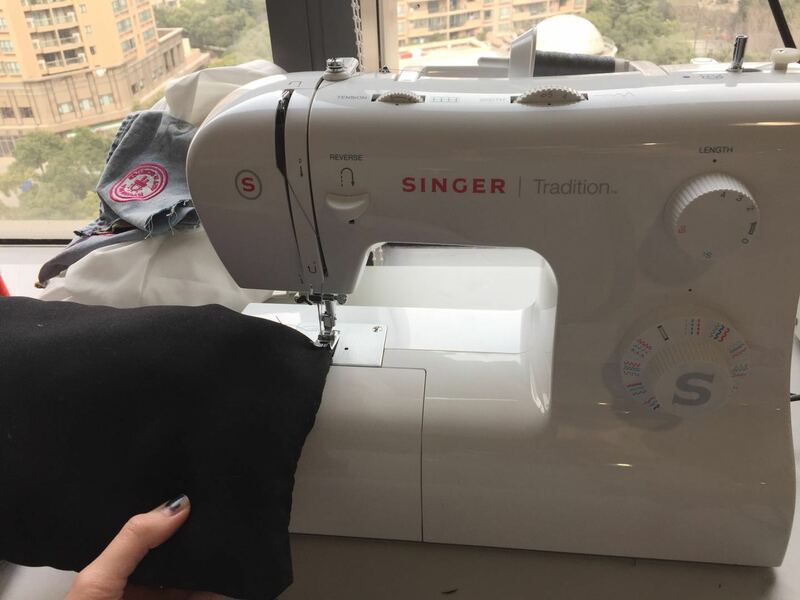 Next I sewed the pillow, starting with some material in the lab and using the sewing machine to create a little pillow which I stuffed with stuffing. 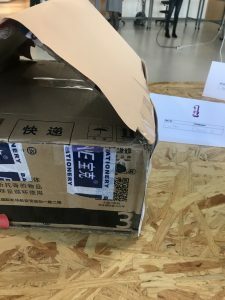 Finally, I created a little cardboard box to cover it and a sign using the letters from old IMA event signs to cover up all the electronics and arduino so that only the pillow (with the sensor under it) and the alarm clock (with the servo on the back) showed in front under the sign. Finally, I tested it on a few friends to see if it was intuitive and took it to the show! 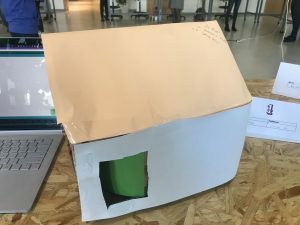 While I was able to solve most of the coding and hardware challenges with the help of the fellows and learning assistants, there were a few things I tried to solve that I wasn’t able to. 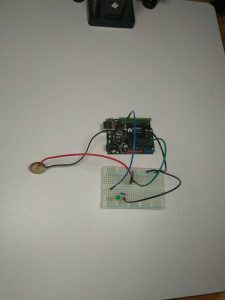 Mostly, I wanted to change the alarm beep of the buzzer to a little tune that I had found under the examples of the arduino code. However, no matter how much I tweaked the code, I could only get the tune to play the first time the sensor felt pressure and not again after. I went back to just using the beep after not being able to solve this. Also, at the show I received a lot of questions as to why there wasn’t a delay between triggering the sensor and setting off the alarm (i.e., so someone could “sleep” for a bit and then get woken up by the alarm) and also why the alarm is triggered by the person “sleeping” instead of letting them wake up first. In hindsight a delay would have been smart, but unfortunately I didn’t think to program it that way before. Overall, I think it did turn out to be successful. 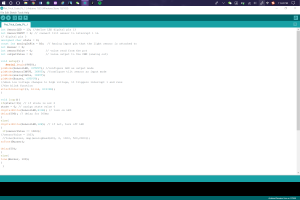 I was able to create what I had in mind originally, and I’m glad that I was able to code and program so much on my own. I’m so excited to put my new skills to work on other projects in the future! “Copy, transform, combine,” this is the basis of any remix. In this Ted Talk, Kirby Ferguson argues that everything is a remix and that instead of getting caught up in the “originality” of creativity, we should embrace remix itself as a creative art form. He claims that copyright laws have made creative works into products and through this process, it has made it more difficult for a remix to thrive and to build on the works of the past. He argues that by patenting and copywriting ideas, we are limiting growth and creativity. He uses the examples of Bob Dylan and Apple to demonstrate how creativity builds on the past and the issues that can come from treating good ideas as objects. Apple is a particularly interesting case since Jobs, the founder of Apple, openly admitted to remixing ideas of the past in order to create his company’s products, but patented his own ideas so that others could not build off of them. Ferguson argues that if everyone in the past patented their ideas, we wouldn’t have many things we have today which are built off of them. I am very much looking forward to this next section as remix is something that I actually have experience with, having taken a couple of music tech classes back in high school. Within these music tech courses, we would always have a section on remix and its relation to copyright laws. We’d have debates about whether remix was creative and be subjected to the laws of audio remixing which outlined how many seconds of a sample we’d be allowed to use in order to avoid breaking the law. It was always a serious topic. Every time we had these discussions and debates, I found myself agreeing with Ferguson’s point. While I understand why individuals copyright their ideas and why remixing music is often not seen as as purely creative as other “original” works, I’ve always half-jokingly argued that any music is just a remix of the existing musical notes. Thus, as Ferguson claims, everything is just a remix. This is one of my favorite readings that I’ve done for this class. In “Understanding Comics,” Scott McCloud dissects what the reader believes is “comics” and in chapter 1, he endeavors to remove this single definition of what “comic” means. He discusses hieroglyphics and other early comics, all using dialogue and illustrations of himself. McCloud really emphasizes the importance of how comics can communicate a myriad of messages, that they don’t have to just be funny, they can be informative, even sad. In chapter 2, he defines terms commonly used in comics by examining an “icon” of a pipe. He uses this chapter to explain how images can be simplified but still be recognizable by readers. In chapter 3, McCloud goes deeper into the reader’s experience, more specifically, their senses. He examines how we as readers can interpret what’s between the comics, and how we can imagine what goes on in the negative space of the page. In chapter 4, he elaborates on how the comic’s use of onomatopoeias creates the sound in the readers mind. What really interested me was his emphasis on the different types of comics, especially his stressing that comics can be informative. My favorite comic in high school was actuallly a web comic, “xkcd” by Randall Munroe. His comic, now a book, is about solving ridiculous hypothetical questions sent in by readers with math and science. I love that comic because I feel like I’m learning something while enjoying funny content. McCloud’s book really explained to me why I’m so satisfied by reading comics, just as satisfied as when I watch a short video. McCloud has made a comprehensive guide to comics that I’ll continue to read. I am really obsessed with the idea of circus performance in VR ever since I watched the rehearsal video of The Greatest Showman. Watching a circus performance in VR brings the whole cast much closer to the viewer compared to going to a Cirque du Soleil show in real life and the tension increases as you are slowly immersed in the environment and the sound right next to your ears. The idea of nested virtual realities is fascinating. This game is rated “best VR Experience” by 2017 Google Play Award in 2017. By looking at the trailer and screenshots, the game seems to have an amazing aesthetic. It features 50+ explorable virtual virtual realities and changes as players to ask their AI character to put on and take off virtual headsets in the game. This exercise was a bit difficult because I had trouble remembering what the inputX<250 impute<250 meant and where that would show up on the screen. The confusing part was the fact that the origin of the function was not at 0,0, but rather 250,250. It was confusing deciphering which quadrant the X and Y input would be in because of this factor. 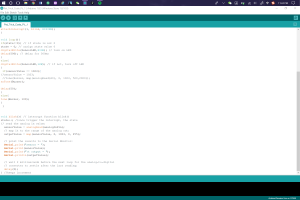 I realized through this exercise that its really important to understand what you are coding and talk yourself through what the code is trying to do, even if it’s in the most simple terms.